On October 10, 1973, just in time for Halloween, television audiences were treated to a spooky offering from the ABC network that stayed with them long after they watched it. 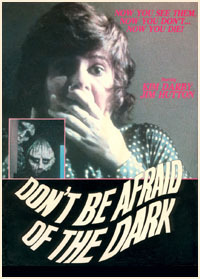 No doubt, children in particular were frightened by Don't Be Afraid of the Dark and its lurid insinuation that small dwarf-like menaces might indeed be lurking in their homes when the lights went out. Alex and Sally Farnham (Jim Hutton and Kim Darby) have just inherited an old house from Sally's grandmother. Although Alex would prefer to live in a high-rise apartment, he consents to the move. The charming place is in a state of dusty decline. Indeed, much restoration and refinishing will need to be done - and so the young married couple hire designer Francisco (Pedro Armendariz, Jr.) to help decorate. In addition, they bring on Mr. Harris (William Demarest, Uncle Charlie from TV's popular My Three Sons), a carpenter who is familiar with the house...having done work on it in the past. Sally is eager to get into the study, which is locked. After a search, she finds the key to the door hidden in an envelope in her grandmother's desk. She would like to turn the room into an office but some renovations have to be done...including opening up the fireplace, which has been inexplicably bricked up. The ash door is bolted shut. Mr. Harris is dead set against opening the fireplace. He tells Sally that it doesn't work and that her grandmother asked him to close it twenty years earlier. He won't reveal why, but says, "Some things are better left as they are." Sally unbolts it anyway. No harm done, right? Wrong. When Sally is out of the study, whispered voices can be heard coming from the depths of the fireplace. "Sally, Sally. Free, free...she set us free!" the mysterious voices chant in creepy unison. A party is planned despite the fact that the house isn't finished. And Sally is unhappy because Alex is too preoccupied with his job. Especially distressing to Sally is the fact that Alex has to leave for a trip to San Francisco the morning right after the party. Later, Sally believes she sees mice and when she tries to go to sleep, an ashtray on a night table is knocked to the floor. She tells her best friend Joan (Barbara Anderson) about what happened - but like Alex, Joan believes it must all be in her imagination. Mr. Harris returns to the study to once again lock up the fireplace. This time, Sally doesn't protest. But it's too late as Sally finds out when something grabs at her dress. "We want you...we want you," she hears. She describes this thing to Alex as being like a "little ferocious animal." The ash door has been unbolted and Alex phones Mr. Harris...who promptly quits in response to the suggestion that he is playing head games with Mrs. Farnham. It's the night of the party. Guests have arrived, including Joan and her husband George (Joel Lawrence), as well as Alex's boss Tom Henderson (William Sylvester). Sally is a bundle of nerves and is not helped by the fact that a small mutant creature is hiding in the flower arrangement. It's all too much for Sally, who screams when the creature tries to pull a napkin off her lap and she finally sees its face. Alex doesn't believe her. After all, nobody else saw it. While Sally is taking a shower, the light is turned out in the bathroom. Whispered voices can be heard speaking to each other. Let me just scare her. They do just that. When Sally turns the light back on, she finds a razor blade on the floor as the creatures scurry away. Now she's had enough and tells Alex she wants to sell the house. Mr. Harris returns to retrieve his tools. He has a short conversation with Alex about "superstitions" and when he goes into the study, the creatures attack him with a screwdriver. The dastardly monsters believe the old man has betrayed their secret. "I didn't tell," he pleads. Alex has left for his business trip and Joan invites Sally to spend the evening with her. But not before a terrible incident occurs. Francisco, just told that his services will no longer be needed, trips on a cord that was meant for Sally and stumbles down the staircase to his death. "It was a mistake, Sally. It's your spirit we want!" says one of the creatures. Sally's hands are burned as she tries to grasp the cord. She shows the marks to Joan, who now believes her friend's outlandish story. Alex returns early and Joan explains the situation...as sleeping pills begin to take effect on Sally. Joan encourages Alex to phone Mr. Harris, who tells Alex to come over right away. Mr. Harris finally reveals the whole story to Alex: Sally's grandfather unbolted the fireplace, which had been locked up since the 1800s. The disastrous act unleashed the house's evil presence and Grandpa was taken down into an abyss...where he probably remains to this day. Meanwhile, the power is cut at the Farnham home and when Joan goes outside to check on the cables, she finds that she cannot re-enter. Alex and Mr. Harris rush back when a phone call from Sally is cut short. A big creepy house, scary whispers, dark lighting, a downbeat ending...and things that go bump in the night. These are ingredients for a good thriller and Don't Be Afraid of the Dark delivers. Special mention should go to makeup man Mike Hancock, whose exceptional work brings the creepy dried-prunehead critters to frightening reality. Kim Darby might best be remembered for this movie and her turn opposite John Wayne in True Grit. But fans of TV's Star Trek [The Original Series] may also recall her memorable performance as the title character in the classic Miri episode. She has continued to grace the small screen and even finds time occasionally to appear in theatrical releases, including 1995's Halloween: The Curse of Michael Myers. Jim Hutton would return to the genre in the underrated Psychic Killer (1975) but the actor passed away prematurely in 1979 of liver cancer at the age of 45. Son Timothy would continue the acting tradition. Director John Newland had previously helmed the Made-for-TV Crawlspace, as well as the Night Gallery series. In addition, he directed Joan Crawford's final acting vehicle, an episode of The Sixth Sense entitled Dear Joan: We're Going To Scare You To Death. Newland continued working in television (Wonder Woman, Fantasy Island) throughout the seventies and early eighties. He died in 2000 from complications due to a stroke.